Do you want the complete guide to feeling empowered & in a position of control when dealing with narcissists?! Is there a narcissist in your life that you're finding difficult to deal with? Perhaps a controlling partner or an overbearing colleague at work? Egotistical "friends" who somehow seem to have a way of elevating themselves while bringing you down every time you see them? A family member who constantly oversteps the mark with their arrogance and manipulating ways? A neighbor who seems intent on making your life miserable? Whatever the case, this book has will help you first understand these individuals, and then, perhaps more importantly, will guide you in exactly how to deal with them. In the first book we'll look at the origins and causes of narcissism, the nine traits of a narcissist - what you should be aware of when meeting someone you suspect is a narcissist, narcissism vs. narcissistic personality disorder, the differences between covert and overt narcissism, the narcissist's drug and their greatest fear - Primary and secondary narcissistic supply, narcissistic injury and narcissistic rage, how to spot the narcissist - on a date, in your friendship circle, in your family, in the workplace & on the Internet, and finally, dealing with or getting away from the narcissist. In the second book, we interview a self-confessed narcissist and ask them 70 probing questions to understand why narcissists do what they do and why they apparently feel so little remorse for the way they use and abuse their victims. Finally, in the third book we'll look at exactly how and why you must break all contact with the narcissist in your life. You will see that dealing with narcissists is actually easier than you think when you follow a simple set of rules. Don't let the narcissist in your life bully and abuse you for a moment longer! Take action now! No Contact With the Narcissist! The content in this is great - it would be a 5 star if there was more detail on dealing with an ex-narc when you have a child together. The reader’s performance was not great - her tone had a monotony to it that put me to sleep several times. Also some interesting pronunciations throughout. All in all, worthwhile though. I liked the book, but I felt it centered too much on the interaction between spouses. There are millions of people that have NPD in their families and it is not easy to get accurate information on the problem and solutions. I had a covert narcissistic mom, an overt narcissist brother and my sister is a malignant overt narcissist and turned her son into a narcissist, as well, so I have had to go no contact with my relatives. I don't know what the percentages are of NPD spouses as opposed to NPD parents, siblings, children, etc., but it would have been nice to see the issue examined more thoroughly from a different perspective - especially considering that this is the COMPLETE guide to narcissism and NPD. It would have to be earth moving because they leave a wake of destruction in their trail but it's never their fault. It's always the other person, but what they cannot see is that the same thing keeps happening only to them. It's very sad and very dangerous. I enjoyed listening to this book. The authors seemed optimistic, but with this disorder getting the person to accept that they have this problem is hard to nearly impossible unless something really really bad happens to them. It's well explained in a simple easy to understand fashion. I used this to give to my teenage daughter, too, so that she would understand. It's enlightening to know the forces you're up against when the person seems so normal to the outside world but is so unfeeling and hot and cold at home. If you are in the perplexing up and down. If you are in the perplexing up and down, topsy-turvy world of being in a relationship with a narcissist, this book is for you. It describes, non-judgmentally, all different types of narcissism and gives you clear guidelines as to what to expect. Excellent, thorough information from this book. Excellent, thorough information from this book. I have listened to several and this was at the top of the list. It is easy to understand the book. It is easy to understand the book with valuable powerful knowledge. It has been like a therapist to me. It gave me a solid foundatio. It gave me a solid foundation for a disorder and helped me how to develop my communications skills when dealing with them. It also taught me how to set my limits and makes a better decision regarding relationships. It is an excellent book. 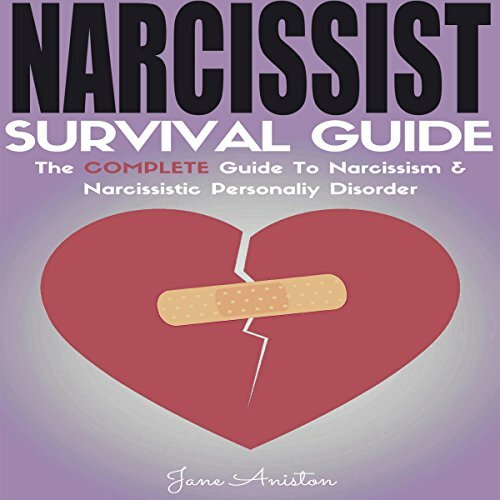 I advise anyone who wants to know the basic, advanced, professional and expert information about Narcissistic Personality Disorder, to listen to this book. Great book to understanding the disorder. Great book to understanding the disorder. Nothing emotional, just the facts, and I loved it! This book is so accessible and helpful, yet is still a light listen. Would really recommend it! Having a co-worker that was and still is, self-absorbed, I needed to understand and deal with this personal personality. This book is a tremendous help. I highly recommend this audio book! It's not easy to understand those self-centered people, I have a friend whose has this kind of attitude and believe me, every word she tells is always about her. But then, she has a good side of her which made me stick to our friendship. I even share to her this book and even joke that I brought this because of her (she looked furious when I said that), but I explained to her, I love listening to this kind of informative books, it just so happens that I found this and just share to her. Overall, I am satisfied with the information that this book has. The author did a great job of providing a lot of useful information in an easy to understand and logical format. The book walks you through a lot of practical advice on how to incorporate their various suggestions into your everyday life! Now I like this audio book, it's pretty impressive, now someone points me in the direction of how to fight a narcissist person in family court.